MorganStanleyGate: Fraudulent North Carolina Extradition Order Approved By Florida Officials ?! . . . What !? This MUST Be Stopped ! 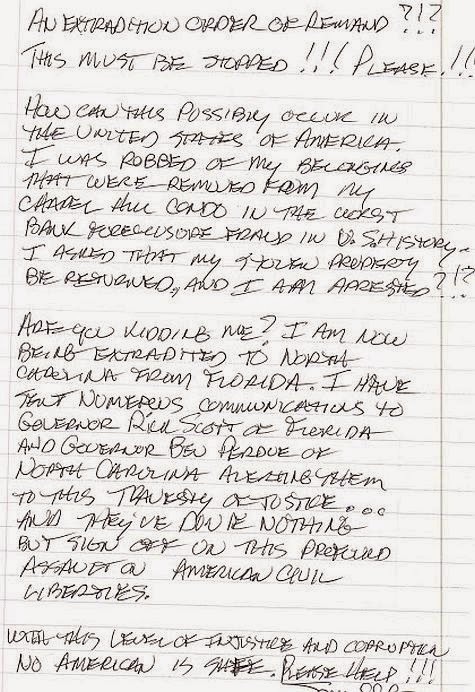 The handwritten note (below) was copied and sent to Florida Governor Rick Scott, North Carolina Governor Bev Perdue, Florida Attorney General Pam Bondi and North Carolina Attorney General Roy Cooper, among others. It reflects profound dismay and frustration that Florida agreed to cooperate in an OBVIOUSLY FRAUDULENT planned extradition (evidenced in the BOGUS Order of Remand (reproduced at the bottom) from Florida to North Carolina on a FABRICATED CHARGE that was later dismissed. By ignoring the evidence of Spencer C. Young's WRONGFUL ARREST AND INCARCERATION and his many pleas to be granted his RIGHTFUL FREEDOM, the above officials (who were EACH in a position to correct this INJUSTICE), KNOWINGLY aided and abetted in this assault on American Civil Rights, and therefore complicit in the cover-up of felonies perpetrated in the LaBarre Larceny Scandal, by NC Judge David Q. LaBarre and his girlfriend, Leah R. Krier. Mr. Young's UNLAWFUL ARREST AND INCARCERATION on FABRICATED CHARGES was executed by LaBarre's long-time friend and THOROUGHLY CORRUPT Durham (NC) District Attorney, Leon Stanback.